Loudspeakers aren’t hard, but making great budget-friendly bookshelf speakers is a science that Polk has perfected. The TSi200 has a sweet spot in Polk’s bookshelf lineup, offering many of the company’s unique technologies and features without the high price tag of higher-end models. So, how good is the TSi200 bookshelf speaker compared to other products within this price range and to the company’s older, more known models? The design of the Polk TSi200 Bookshelf Speakers isn’t ground-breaking, but it does the job right and would look nice as part of any home theater system. The cabinets are made of washed-wood black MDF, and they feature a sheen finish on the top. The drivers on the front can be either exposed or covered. The design is interesting, aesthetically speaking, but as we said, nothing that screams “luxury” here. In terms of the size and weight, the TSi200 are a bit bulky for a couple of 2-way bookshelf speakers. Each of the units measures 11.8 x 8 x 15.4 inches and weighs a whopping 17 pounds. A bit heavy? Maybe, but it’s probably because of the second driver that Polk added to these speakers. 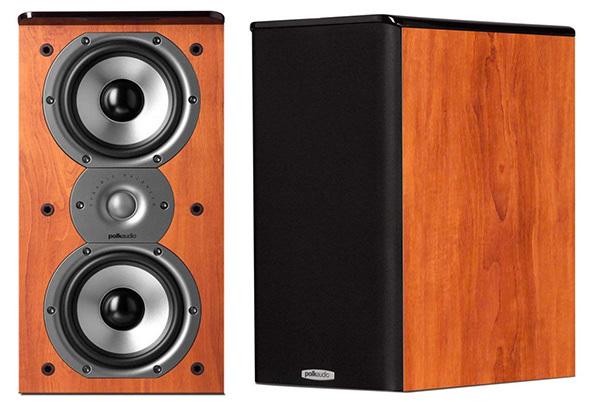 The Polk-tsi-200 speakers also come in beautiful cherry finish for the same price. Thanks to the silk tweeter, the TSi200 speakers can produce sparkling highs that are clear and natural sounding. They may seem too sharp with a bit of an early decay sometimes due to narrow dispersion of the tweeter, but the sound is captivating with great clarity most of the time. For a bookshelf speaker, the TSi200 offers realistic and punchy bass with good extension. It does not strike by depth and scale, that’s for sure considering the size and price of the cabinets, but it’s more than what you’d expect from a pair of speakers in the sub-200 price range. The smooth and detailed top end offered by the TSi200 bookshelf speakers blends nicely into the midrange frequencies. The deep tones and rich mids are incredible for a compact-sized speaker, making this model an ideal choice for those looking for a balanced sound spectrum without breaking the bank. To be fair, the tonal balance of Polk’s TSi200 bookshelf speaker is not perfect as there’s clear tendency to lightness along with a slight decrease of images, which leads to the effect of “rejuvenation” of singers. Nevertheless, these loudspeakers are still the musical time machines as they can get you in the beats for real. The vocals coming from the TSi200 bookshelf speakers are pretty clear and immersive, which makes watching movies while listening to these loudspeakers quite the superb experience. In the package, you’ll find all the essentials for quick installations, including the Cherry bookshelf speakers, a detachable cloth grille, eight feet of Self-adhesive rubber, a user manual, an online registration sheet, and the Polk Audio product brochure. Nothing fancy, but that’s all you need to start listening to your beats in a quick manner. It’s hard to go wrong with a Polk loudspeaker, that’s a fact, but is the TSi200 bookshelf speaker the best option within this price range? We wouldn’t be fair if we said that that’s the case. Although this model is quite good, with decent, punchy bass and clear sounds all the way from the top end to the bottom frequencies, there are better options out there, such as the Audioengine P4 and the Fluance Signature Series Bookshelf. It’s a matter of personal preference, of course, so make sure to determine your needs and set your expectations right when making your choice. At time of review, the Polk TSi200 featured in our “Best Bookshelf Speakers Under $200” category. Please check above for latest price and user reviews.